The MagnaLatch® ALERT models set entirely new levels for safety gates around swimming pools, childcare centers, schools, homes or wherever child safety is critical. 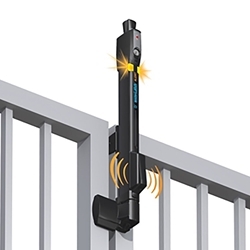 While the Top Pull model is ideal for all child safety applications, the shorter Vertical Pull model offers protection on pet security and general-purpose gates around the home and garden. A single beep upon opening warns of visitors or intruders. The Top Pull model meets standards for safe pool barriers where the release mechanism of the gate should be at least 54" from the bottom of the gate. This keeps a young child from reaching the latch and getting to the pool. If you do not need to meet these guidelines choose the shorter Vertical Pull model.